I have always wanted to paint hot air balloons because they are so fascinating and joyful. 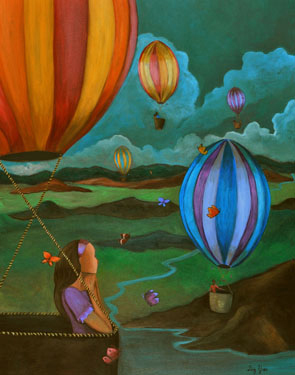 In this painting I have painted five balloons symbolizing five different journeys. It is about the diversity of each and everyone of our life journeys and finding the joy in them. We are all blessed with a destiny that is chosen by us or a higher self and every one is as valuable and relevant in comparison with others, no less or more important. The secret of our destiny lies in how we travel our voyage. Some people take the road less traveled and some prefer the safer route, I believe as long as we find the joy in each of our journeys, our lives will be fulfilled.